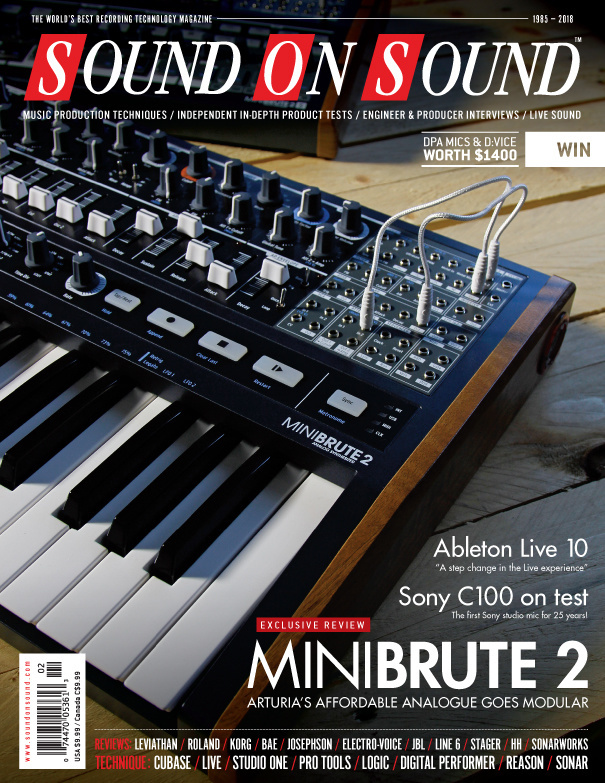 Reviews: Arturia MiniBrute 2 & 2S (Cover), Ableton Live 10, Sony C100, Roland D05, Line 6 Helix Native, Korg Kross 2, JBL 7 Series, Arturia Keylab Essential, Electro-Voice Evolve 50, Sonarworks Reference 4 & Standalone. Techniques: Inside Track: Cardi B 'Bodak Yellow', Making Modern Metal, Joe Chiccarelli & Maxime Le Guil: Recording Morrisey, Digital Performer's Comp Tools, Field Recording, Transferring Sonar Projects To A New DAW. We check out this high-fidelity two-channel stereo audio recorder and playback module that can record high-quality (stereo) WAV files whilst simultaneously playing two different (stereo) files. With Live 10, Ableton’s aim is to make the music‑making process as smooth as possible. Have they succeeded? ART’s MX622 is a 1U rackmount mixer equipped with three balanced XLR microphone/line-level inputs, plus three stereo line inputs on RCA phono sockets. BAE’s first guitar pedal was borne of a fruitless search for two classic 1960s stompboxes. Both volumes in the bundle provide a selection of multi-sampled, multi-articulation, virtual brass instruments that are playable in exactly the same way as a conventional orchestral sample library is but are much more suited to soul, funk and pop. This suite of six MIDI sequencer tools run as AU-only plug-ins within a suitable AU-host. Rozeta also makes use of one of the new features Apple has snuck rather quietly into the iOS 11 update: the ability for AU plug-ins to send MIDI Out data. The D4 is a single-channel mic preamp based on a design created by EMI’s in-house Recording Engineering Development Department, as part of the development of the REDD.51 tube console. The MÖG Wavefolder doesn’t just modify waveform shape, it squishes, shifts, boosts and distorts — and is equally happy doing the same to control signals. Hot Wax is a dual overdrive pedal that draws upon and combines two existing EHX pedal designs, the Crayon and the Hot Tubes. Portable column-style sound systems have been around for many years, but US veterans Electro-Voice may have just perfected the art. If you’re looking for a monitor that goes loud and low, and has excellent high-frequency performance, JBL’s new range might just fit the bill. This high-end valve mic sounds every bit as classy as it looks, and a unique voicing switch adds to its versatility. The Kross 2 enjoys the twin benefits of Korg’s workstation pedigree and an attractive price tag. This neat gadget opens up a host of possibilities for electric and acoustic guitar. Helix systems are converting many guitarists to amp modelling, and the newest of them brings Line 6’s latest algorithms to your DAW. Caspian: Thematic Orchestral Brass comprises three .NKI patches: Six French Horns, Three Bass Trombones and Three Trumpets, performed by the Czechoslovakia-based Capellen Orchestra. Thirty years after the launch of the groundbreaking D-50, Roland’s Boutique version offers the same iconic sound. Expeditions uses the powerful (and very deep) Kontakt-based front-end that provides loop playback, manipulation, a range of creative effects with sequencing options, and is designed to inspire hi-tech music tracks/cues. Sonarworks’ headphone and monitor correction software has spread its wings outside the DAW, and now encompasses more headphone models than ever. Hand made in Nashville, these mics use old-school materials and manufacturing techniques to deliver that classic ribbon sound. The Towner system fits many guitars that have a separate bridge and stop tailpiece. It mainly works with Bigsby B3 and Bigsby B6 vibrato units, enabling them to be secured using a single two-inch strap-button screw. Grammy-winning producer Ian Brennan discusses his approach to working with unique artists in outdoor locations around the world. We examine three different ways to harness the power of granular synthesis in Live. When a track contains nothing but beats and vocals, the vocal mix has to be perfect. Mix engineer Evan LaRay explains his role in taking Cardi B’s ‘Bodak Yellow’ to number one. We take a closer look at the automation features in Logic Pro X. Pro Tools isn’t just for recording and mixing. It’s also pretty handy for mastering work. Propellerhead’s uber-modulator Synchronous is now included for free with Reason 10. Get your Studio One ducking techniques in a row as we explore different ways to improve vocal intelligibility. This month, Studio SOS takes on a unique challenge: modifying a motorhome for use as a mobile recording studio! A glorious suite of extras bolsters the core orchestral sound. We show you how to transfer your projects from Sonar to a new DAW. Manage effects and processors more efficiently in Cubase’s MixConsole. We explain how to use Digital Performer’s comping tools to assemble a killer vocal take. Messing with meter makes for more memorable music. We discuss another handful of hit records, to help you brush up on your listening skills. Q. How can I match my mixer’s insert send levels to a high-end compressor? Read more about Q. How can I match my mixer’s insert send levels to a high-end compressor? Q. Is the SM57 really any good for snares? Loads of people recommend putting up an SM57 on the snare drum, but it just sounds dull and lifeless when I try to do that. Any tips? Read more about Q. Is the SM57 really any good for snares? We conclude our in-depth guide to the world of library music with an essential cut-out-and-keep explanation of the key words and phrases you’ll hear. Check out the Winners of the SOS Awards here. Media content for the February 2018 issue.